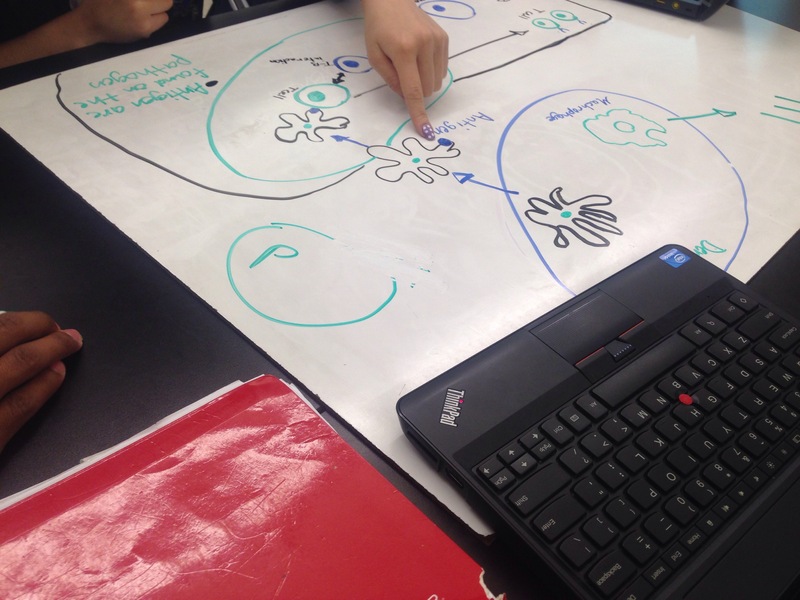 Innate and Adaptive Immunity – Flipping, Whiteboarding, Case Studies, Thinking! The human immune system is extremely intricate and complex. In a high school A&P class, it’s an extremely important but somewhat abstract process. Like every process in physiology, we have to simplify it with a model, which we can add to as we learn more (for example, my students who go on to biology or other pre-med majors will learn a lot more details about innate and adaptive immunity than we do in my A&P class). In past years, this has been a section where I do almost all of the talking. Because of the complexity, I felt like I had to explain it all super clearly for students to understand. Of course, most students still did not understand because they didn’t have to construct their own meaning and do their own sense-making. Innate Immunity includes the first lines of defense, such as the physical barrier or skin, the chemical barrier of antibacterial substances, and cells that move to infection sites to kill pathogens and activate adaptive immunity (described in steps 2-5). Adaptive immunity starts when an antigen-presenting cell (APC), usually either a dendritic cell or macrophage, eats and processes a pathogen and shows this antigen to a helper T-cell. The helper T-cells then take this information and activate B-cells and other T-cells. Activated B-cells then produce specific antibodies that disable and mark pathogens by binding to their antigens. Activated T-cells (called cytotoxic or killer T-cells) destroy infected human cells, which helps stop the spread of the pathogen. As you can see, if you’re not familiar with the process already, it’s pretty abstract and confusing at first. This year, I did it very different. The rest of this post will explain the lesson cycle and what I learned from it. In all, this lesson takes 2 to 2.5 class periods of 50 minutes each. I started off by assigning Paul Andersen’s Immune System video as homework. Students were required to take notes on the video. This can be a bit daunting, so I showed them this slide to give them a guide for important terms they will need to know. (That slide also tells students to look up the difference between antigens, pathogens, and antibodies. In a rare critique of Paul’s excellent videos, this particular video does not differentiate between an antigen and a pathogen, which is confusing for students at first.) In short, I’m using a Bozeman science video to flip the classroom. Example 1: A particularly thorough board with good explanations. Example 2: Another good board, but simpler. This required me to ask the group a lot more probing questions, such as, “Do the T helper cells become B cells? Or do they just communicate? What’s going on there?” If they couldn’t answer right away, I would leave them with a few good questions (unanswered) and come back later. When I got back to them, they usually had figured it out and were eager to share what they had learned. Example 3: A house metaphor. It was a bit of a stretch, but overall it worked for this group. Paul, in his video, uses a castle metaphor, which inspired this house metaphor. There were some good connections made, though I think the metaphor breaks down once you get into the different types of cells. As they worked, I asked them questions about what they had written. This revealed a lot of gaps in their understanding, and they had to discuss or go back and read more information about the process. It went really well. Here is another picture of a member of that group explaining the difference to a different group. After students had made their boards, we gathered in a circle to present and discuss what they had drawn. This is something I’m still learning how to best facilitate. It can be a bit awkward at first. If you want to know more about how board meeting work, here is a great post by Kelly O’Shea, who uses whiteboards in her physics classes. I try to model how to ask good questions. It gets really quiet for a bit, as students wait for me to lead the group. Then….I leave (i.e., move out of the circle to another part of the room). This was hard to do…hard to give up some control. But something magic happened when I left. They took over and started asking great questions and sharing explanations. My absence was the best thing for helping them start to own their own learning. Of course, I still did interject and ask a question here and there to give them some specific things to discuss. One example of this was asking them what the difference between humoral and cell-mediated immunity. I asked, then left the circle again. Now that students have a pretty good grasp of how innate and adaptive immunity works, I finish this lesson cycle with a case study that I wrote about a man who doesn’t know that he has HIV. The case helps reinforce how immunity works and gives students an organism-level example of the effects of a compromised immune system on the cellular level. If you want to use the case study I wrote in your class (and edit if needed), please do! I would be honored. Students work on the case study individually mostly, but they are allowed to discuss answers or work in a small group if they wish. If they don’t get finished with the case, I’ll have them finish the rest as homework. The next day, we’ll discuss the case study briefly, I will give a short quiz, and then we’ll move on to the lymphatic organs. Prev Here is the plan!